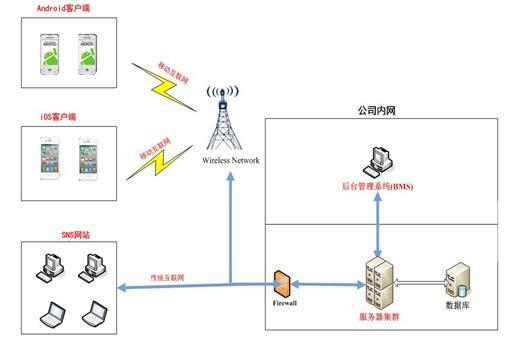 As the above picture shows, this system consists of four major components "a server and three client" : "Android phone client + iPhone client + mobile travel background management + mobile travel server". • Mobile phone client: run on smart phone and tablet PC. This system is convenient for drivers to know information real-time, and also improve the tourist's interaction and use feeling. It can support Android mobile phone and tablet, iPhone and iPad. • SNS website: Web client program is visited through browser, provide to the use of drivers. • Background management system (BMS) : belonging to the Web client program, visit through the browser in the PC. It's mainly used to manage and maintain the mobile phone client contents and data, and provide decision support through the comprehensive summary analysis data. • Server: provide the service to background management, website and all mobile phone clients as application sevrer, also can intergrate and dock with the tourism company existing business system through the application integration interface. If the concurrency value demand is too big, the server can be deployed by cluster server consists of many sets of high performance server, provide load balancing and fault transfer function, avoid visiting congestion or system paralyzing. A) website, background management system and the server are consist of B/S structure, then the application server is also the Web server. B) mobile phone client and server are consist of C/S architecture.